Most metal materials can be marked with microglyphs by a laser. Even parts and components providing curved and strongly reflecting surfaces are well suitable for beeing marked with the robust codes. Depending on the application, the laser produces a color change on the material (laser-annealing). Or the microglyph mark is applied in form of tiny depressions (Laser-engraving). On coated metals like anodized aluminum, the laser can be used to remove the top layer in order to expose the basic material. microglyph codes require very little contrast. A slight color change or a delicate engraved mark is sufficient to create a robust microglyph code on the material. 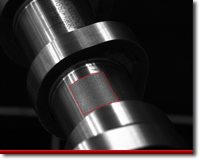 On metal material, the process window for microglyph marking is very broad. 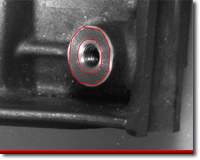 A further common method for microglyph marking on metal surfaces is Dot-Peening, which is best suitable for rougher metals like cast iron parts, as they are commonly found in automotive motor production.